Pope In Philadelphia: 'In Families, There Is Always Light' : The Two-Way In remarks delivered at the Festival of Families, Pope Francis emphasized the importance of caring for grandparents and children. Earlier in the day, he spoke at Independence Hall. Pope Francis takes the stage at the Festival of Families on Saturday evening in Philadelphia. Pope Francis, in a speech at Independence Hall in Philadelphia, spoke of the need to preserve religious freedom throughout the world and warned against the use of religion "as a pretext for hatred and brutality." "In this place which is symbolic of the American way, I would like to reflect with you on the right to religious freedom," he said. "It is a fundamental right which shapes the way we interact socially and personally with our neighbors whose religious views differ from our own." He said the ideal of interfaith dialogue is for men and women from different traditions to come together in peace. 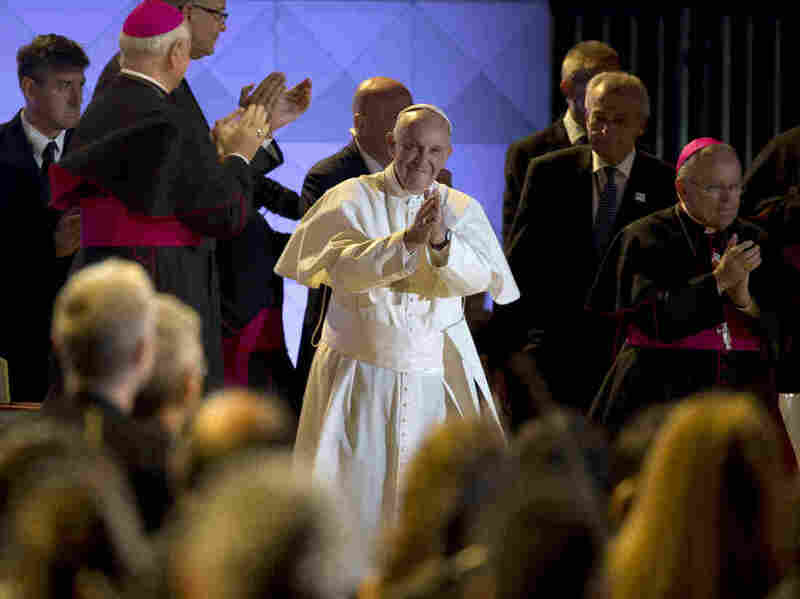 "Religious freedom certainly means the right to worship God, individually and in community, as our consciences dictate," the pontiff told a crowd before the historic hall. "But religious freedom also goes along with places of worship and the private sphere of individuals and families." He said history had shown "the atrocities perpetrated by systems which claimed to build one or another 'earthly paradise' by dominating peoples, subjecting them to apparently indisputable principles and denying them any kind of rights." However, Francis warned that: "In a world where various forms of modern tyranny seek to suppress religious freedom, or ... try to reduce it to a subculture without right to a voice in the public square, or to use religion as a pretext for hatred and brutality, it is imperative that the followers of the various religions join their voices in calling for peace, tolerance and respect for the dignity and rights of others." He spoke of the Quakers who founded Philadelphia, saying they were "inspired by a profound evangelical sense of the dignity of each individual and the ideal of a community united by brotherly love. "This conviction led them to found a colony which would be a haven of religious freedom and tolerance," he said. 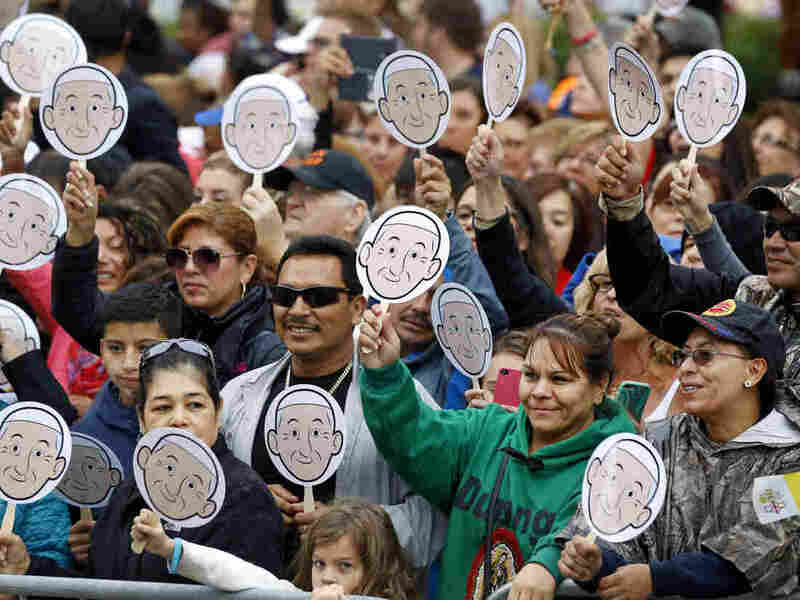 People wave images of Pope Francis as they wait for him to arrive for a Mass at the Cathedral Basilica of Saints Peter and Paul in Philadelphia, on Saturday. Earlier, en route to New York's JFK Airport, where he later departed for Philadelphia, the pontiff asked that his helicopter circle the Statue of Liberty and Ellis Island. "You could see he was very, very moved," New York's Cardinal Timothy Dolan told reporters, according to Reuters. "And he said, 'You know, Buenos Aires was a city of immigrants too.' "
Later, Frances celebrated Mass in the city at the Cathedral Basilica of Saints Peter and Paul, the largest brownstone structure in Philadelphia and the largest Catholic church in Pennsylvania. In a homily, Francis challenged young Catholics to service and emphasized that the "immense contribution" of women in the church. 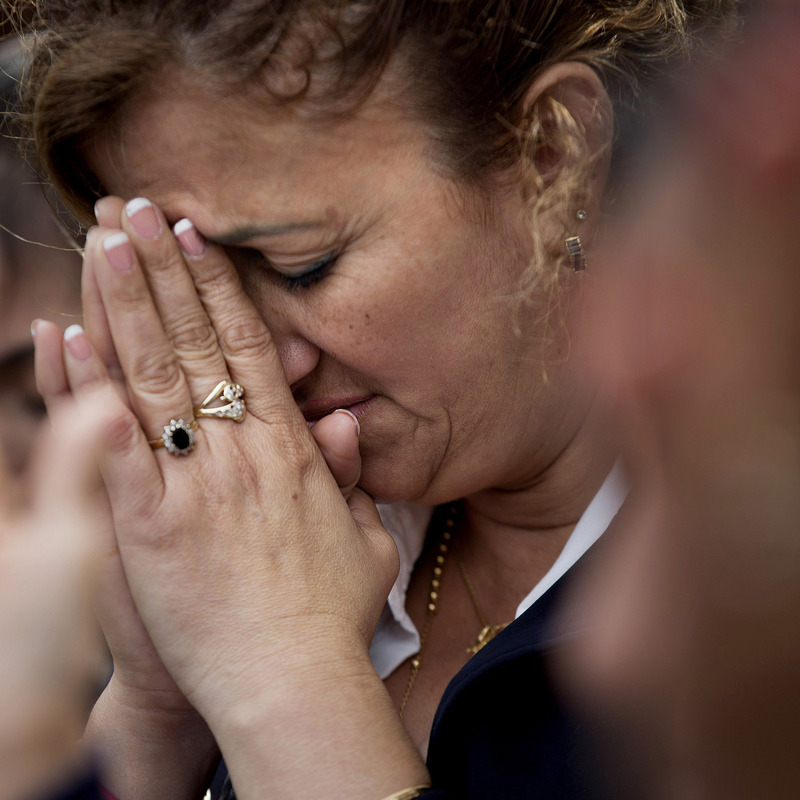 Pilar Cedeno, of Hackensack, N.J., prays as Mass is celebrated by Pope Francis is broadcast to crowds on the Benjamin Franklin Parkway from inside the Cathedral Basilica of Saints Peter and Paul, on Saturday in Philadelphia. "This will require creativity in adapting to changed situations, carrying forward the legacy of the past not primarily by maintaining our structures and institutions, which have served us well, but above all by being open to the possibilities which the Spirit opens up to us and communicating the joy of the Gospel, daily and in every season of our life," the pope said. Francis then visited St. Charles Borromeo Seminary. On Saturday evening, he was the featured guest at the World Meeting of Families conference, treated to testimonials from families and performances from the likes of Aretha Franklin. "The most beautiful thing that God did, says the Bible, was the family. All that love that He made in creation, He gave it and shared it and bestowed it on family," the pope said, in a speech before a crowd of some 18,000 attendees. "In families, there is always light." On Sunday, his last day on U.S. soil, he will celebrate outdoor Mass, expected to draw 1.5 million people. NPR's Jeff Brady spoke with a souvenir seller outside the Philadelphia Convention Center who was happy for the surge in business, but not by the tight security measures. "They shut down the whole city — they shut down the bridges, the buses — for one person! That's crazy! They don't do this for the President!" Christian Andrews-Fulton said. As The Associated Press reports, the pope "will give his attention to both the elite and the disadvantaged, this time visiting inmates in Philadelphia's largest jail. On Saturday night, he will be serenaded by Aretha Franklin and others on the Benjamin Franklin Parkway at a festival celebrating families. He will return there Sunday for the Mass, his last major event before leaving for Rome." The trip to Philadelphia follows the pope's travels to Washington, D.C., and New York. In the nation's capital, he addressed a joint meeting of Congress, urging law makers to cooperate to solve problems such as inequality of opportunity and climate change — themes that he echoed and expanded on at the United Nations General Assembly in New York.